There's been a lot of publicity lately about the new crocodile exhibit that's opened in the middle of Darwin city centre called Crocosaurus Cove, and nearly all of it has concentrated on the curiously named "Cage of Death". 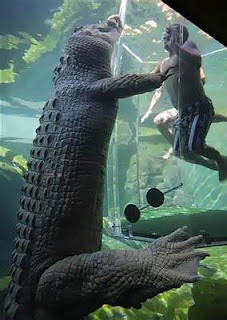 Despite sounding like a good way of getting rid of excess tourists, the cage (which is actually an octagonal cylinder made from thick acrylic) is a way of getting people into the water - safely - with the crocodiles on display. Response to this has been mixed, some believing that it's a great experience and a new way of seeing crocodiles, others thinking that it's a crazy thing to do, and yet others who believe that it's terrible and cruel to the crocodiles. Of course, people get out of it what they want, but frankly we're more inclined to think it's a good thing. Of course, complete transparency here: although we're an independent company, we did put the educational materials together for the exhibit, and were involved in moving the crocodiles in from the local crocodile farm. But I must admit I was skeptical about the Cage of Death at first. Still I have to be honest: just being in the water with a large crocodile is quite a thrilling experience. Part of your mind tells you you're safe, the other part is trying to convince your body (unsuccessfully) to run away, run away. It must be a basic human response when faced with a large predator, especially when you're in its element and not your own. How do the crocodiles respond to all this? What they don't do, of course, is view the Cage of Death as a feeding opportunity. At first they were somewhat annoyed by it, but they quickly learned that it was neither a threat nor a problem, and often do not deign to give it any further attention. But if you're in the water when they're in a curious mood, they'll come over and check it out. Crocodiles do get a rep as being bloodythirsty killers, but in reality they're just looking for opportunities in a completely detached, crocodile-like way. There shouldn't be any stress involved, particularly for a captive crocodile that is happy in the knowledge he's got plenty of food and space available. That's all crocodiles in the wild are looking for most of the time, after all. And the enclosures at Crocosaurus Cove are certainly in keeping with the modern zoo mentality of giving the animal what it wants first, and what humans want second. The great power of zoos, of course, is to educate people. Crocodiles are animals that people need to know about, especially if they live in crocodile habitat or visit crocodile habitat. It should be our responsibility, and that of local governments, to ensure that people understand safety around crocodiles. Failure to do this is splashed over the front page of every newspaper in the country, and crocodiles sink yet further in public perception. As long as those zoos are not failing in their duty to provide their animal occupants with all the essentials to keep them happy (not just to keep them alive) then they can play a valuable role.